The National Shooting Sports Foundation (NSSF), in partnership with the United States Practical Shooting Association (USPSA) has launched a new pistol-shooting discipline for high school and collegiate shooters — the Scholastic Steel Challenge (SSC). The Scholastic Steel Challenge program is being modeled after the highly successful NSSF-developed Scholastic Clay Target Program. The NSSF will help launch this new discipline with a $50,000 grant to the SSC, administered under the USPSA. The SSC competition format is based on the Steel Challenge, a popular action pistol competition that attracts some of the world’s best shooters. The scholastic version has been designed so it can be enjoyed by both novices and experienced shooters. 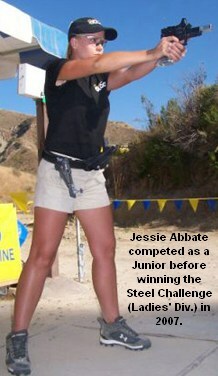 Competitors will engage targets from a low-ready position and not from holsters as is done in the Steel Challenge. SSC is open to all eligible youth shooters. There is a Junior Division for 14 to 16-year-olds and a Senior Division for 17 to 20-year-olds. Scores and rankings will be posted online, and championships will be awarded in both divisions. “Developing new target shooters through programs that teach safe and responsible handling of firearms is a priority of the National Shooting Sports Foundation, and we’re proud to help a program get off the ground that holds so much potential for introducing new shooters to a lifetime sport,” said Steve Sanetti, NSSF President. Share the post "NSSF Launches Scholastic Steel Challenge with $50K Grant"